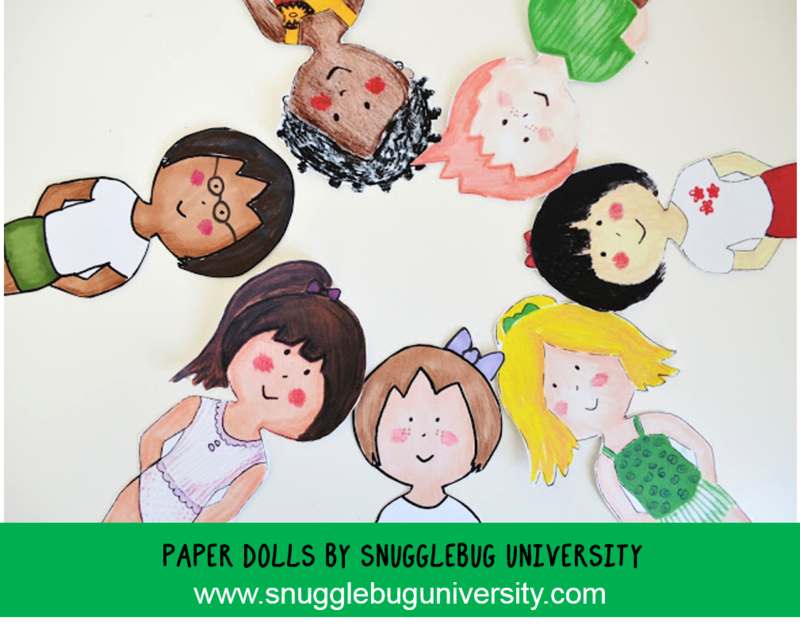 Snugglebug University: Fairy Tale Paper Dolls and a Free Paper Doll Printable too! Fairy Tale Paper Dolls and a Free Paper Doll Printable too! A few days ago I introduced my Girls of the World Printable Paper Doll Set. Today I'm going to introduce you to another paper doll set, Fairy Tale Dolls AND I'm going to give you a FREE blank printable so that you can color in your own paper doll! As I mentioned before in this long story, this project came about because of my daughter Lu. She helped me design the two paper doll sets that you can now find in my shop. She wanted you to be able to make your own paper doll too though, so we decided on this FREE printable. Depending on how you color it in, it can be a boy or a girl. It comes with two outfits that you can color in, a dress and a pant set. They are the perfect size to be friends with all the other paper dolls we made, at about 9 inches tall. 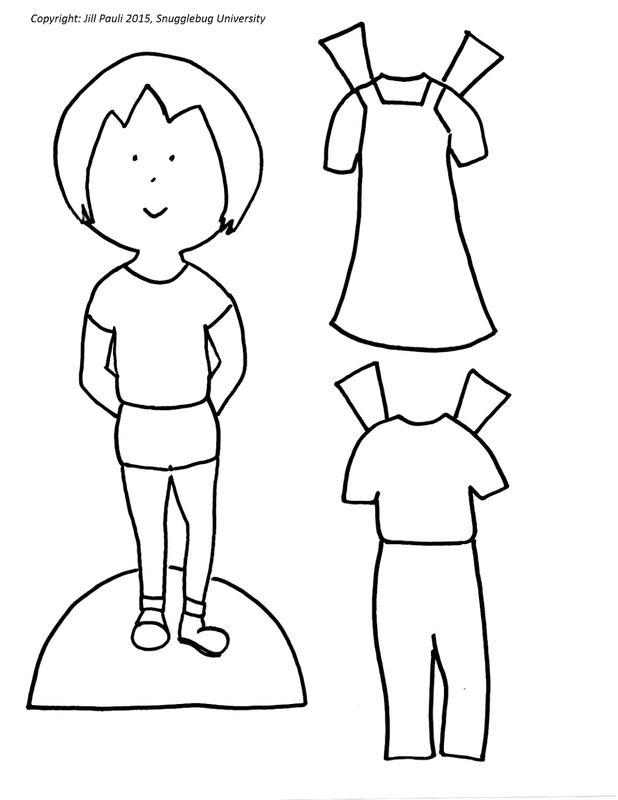 I really love offering a version of the paper doll to color in, because it gives kids (and grown ups too!) the chance to make a doll that looks more like themselves. Here's the doll I made below! Now that you're busy making your own paper doll, I'd like to introduce the rest of the dolls in my Fairy Tale Printable paper doll set. There are two dolls and 10 outfits. There is a fairy costume, knight costume, prince costume, princess costume, mermaid costume, wizard costume, Hansel and Gretel costumes, and little red riding hood and the wolf costumes. The set features two of your favorite Snugglebugs, Sammy the Stinkbug and Cora, the Bookworm! I think little red riding hood and the wolf might be my favorite. And since I always hated it when paper dolls has gender specific clothing clothing as a kid, the clothes on these dolls are all interchangeable. Dress Cora up as knight and Sammy as a mermaid if you'd like! There are so many outfits to choose from! You can find the fairy tale dolls in my shop here. And finally, if you like this set you might also like the companion, girls of the world printable paper doll set. I'll be back with more projects next week! See you soon!